Sift flour into a large bowl. Add salt and baking soda. Stir. Add butter, honey, and lemon juice. Mix well, until everything is combined. Place dough in refrigerator for 30 minutes. In a small saucepan combine orange juice, honey, cinnamon, and butter. Bring to a boil and let reduce for one or two minutes (not a lot). Remove from heat. Pour sauce into a 9 x 13 baking dish. For the bars you actually drop the dough by about 2 inch balls into the orange sauce, instead of spreading the dough out in once piece. 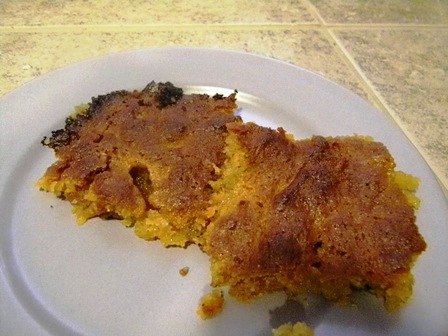 In the end the dough will join together, but having the bars in separate pieces at first allows the orange sauce to seep in between the pieces. 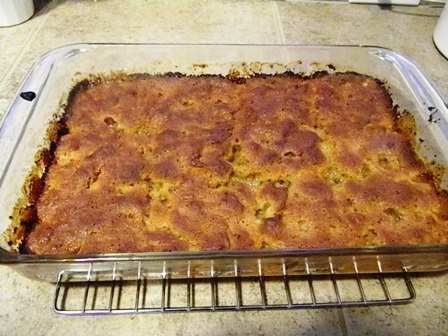 Bake for 20 minutes until the bars are solid and golden brown on the bottom.